PAROC XFP 001 tubular spacer is used in ventilated facades to give a harmonized distance between the wall frame and the facade material. The spacer creates a bearing connection through the stone wool layer. 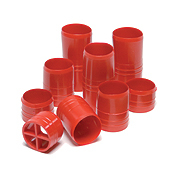 The spacer is made of HD quality polyethylene. Cardboard box. Mounting tool supplied in each package.